UrbanTide’s Pippa Gardner took to the stage for a 6-minute pitch during the #EIE17 event to talk about USMART, UrbanTide’s data sharing platform and how data is transforming the cities and communities we live in. Pippa was honoured with the Spirit of #EIE17 Award for UrbanTide’s achievements! EIE (Engage Invest Exploit) is the largest investor showcase in Scotland, but it is also so much more than that. It is a full programme of support for start-up and scale-up companies actively looking for investment to deliver on their potential and ambition. 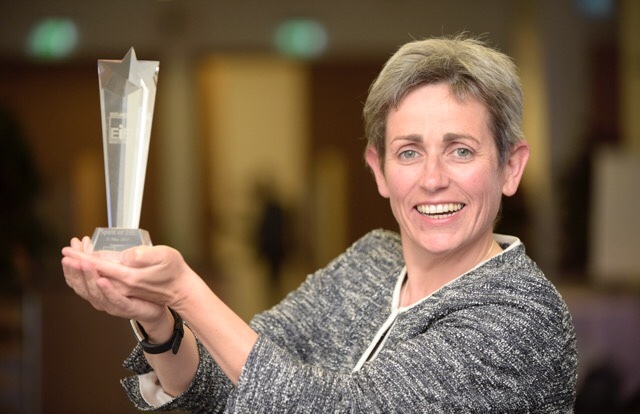 “It was just the icing on an already wonderful cake to receive the ‘Spirit of EiE 2017’ award at the EiE Dinner on 11th May 2017 on behalf of UrbanTide” - said Pippa Gardner, CEO of UrbanTide and fresh awardee - “it is a true adage that what you get out of a process is correlated to how much you put in and we loved engaging fully with the whole EiE journey from start to finish”. For us, this culminated in a coveted 6-minute pitch slot and a very successful day networking with potential investors, taking UrbanTide to the next level in terms of being investor ready. We would just like to reiterate a massive ‘thank you’ to all of Team EiE for their input, support and encouragement from beginning to end. You can read more about our involvement in #EIE17 here. Our hard work over the past couple of years was also acknowledged and rewarded by the Irish Business Network Scotland (IBNS). The IBNS is a not-for-profit organisation that connects high-level business people from Ireland and Scotland to identify and explore new collaborative business opportunities and add significant value to businesses both in Ireland and in Scotland. On the 8th June 2017, UrbanTide brought home the Innovative Start-Up Business Award from the inaugural Irish Business Network Scotland Award Dinner.